I recently discovered why I haven’t been teaching the piano for the past 25 years. I did in my mid twenties and early thirties. Becoming an accomplished piano player does take practice. I’ve practiced a lot over the years. Yet, during my music education I often had a disheartening experience. After practicing all those hours during a week, I would go to a lesson only to spend much of the time discovering what’s wrong. I’d leave the lesson despondent and sad. But I loved music so much. I’d get over it after a day or two and get back in the saddle. Also, because I loved my teachers and knew they loved me, I didn’t have the overall unpleasant experience that some former piano students have described. I enjoyed my teachers and looked forward to lessons. Consequently, my experience of piano lessons was very much a love-hate relationship and, in hindsight, a little confusing. Somewhere along my journey, I made a decision. I decided teaching wasn’t for me. When asked why I didn’t, I had flippant answers like “Everybody in my family is a teacher. I’m not interested in that.” Given that I do come from an extended family of teachers who are all very gifted and successful teachers, it doesn’t really make sense to diminish the idea of being a teacher, but I did. I never thought about it carefully until that day in the Wisdom Course back in November of 2015. I discovered the real reason why I decided not to teach music. I discovered something that had remained hidden in my subconsciousness all these years. What was the discovery? It was the belief that to teach music was to depress people. To teach music was to have someone come to a lesson and leave sad and despondent. Suddenly, I was fully aware and conscious of this belief. In the presence of this awareness, there were questions to ask. Is this belief true? Yes and no. For myself, I can remember many exhilarating, happy and rewarding lessons. It’s so easy to focus on the bad and forget about the good. However, I can’t ignore the number of times I have spoken with former piano students who had truly unhappy memories of there piano lessons. They tell stories of teachers who were rigorous task masters. Playing the piano became little more than boring technical exercises and practicing the same pieces over and over. Of course they quit. How sad. Learning music doesn’t have to be like that. Am I stuck with this belief? Absolutely not. As soon as I saw it, I got how crazy it was. I was free of it as soon as I discovered it. I am not the same musician or person I was 25 years ago. Now, I still bring to the table all the critical and valuable traditional and rigorous training and skills needed for piano playing and teaching. This is important. But it’s useless if it saps all the joy and delight of playing music from the student. What I also bring is something very rare. It’s the art of improvisation and new skills in listening and facilitating discovery that I have learned from the many programs I have participated in at Landmark. 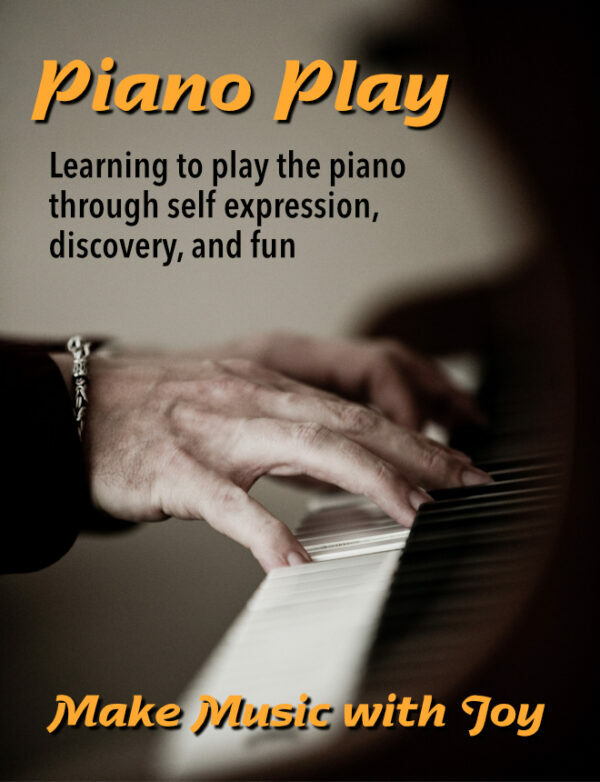 I bring a kind a creativity, discovery, and spontaneity to which many piano teachers likely have no access. I have mastered the art of true self expression at the piano through improvisation and composition. Everyone has this capacity to improvise and create and I have the experience and knowledge to teach this. Improvisation and playing by ear is a remarkable tool for getting to the “heart” of music and for discovering the musical meaning of the written or composed music you are learning whether it be a classical, pop or blues piece. For me, music is the art of emotion. When you can express both “your intention” and the “composer’s” intention in the music you play, you have mastered that art. Would you like to learn to make music in a joyful way? You can begin or continue to learn at any age. You can let go of regret and take lessons again. or contact me today to discuss the possibility of piano lessons.